What Can I Take to Prevent Bruising? 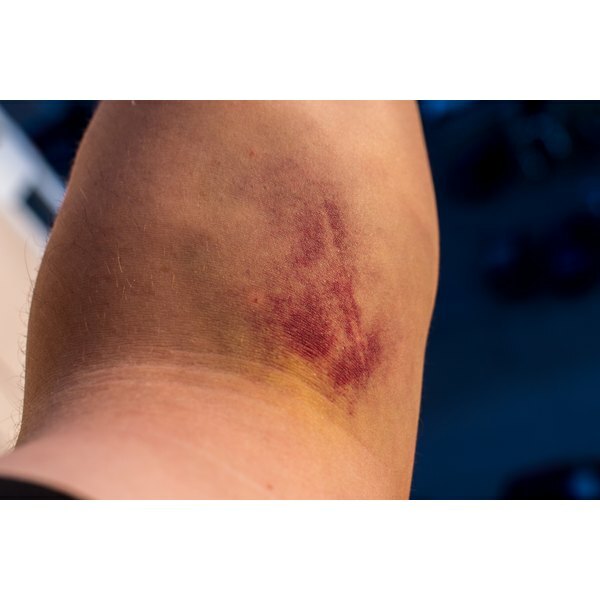 The source of a bruise is as varied as its shape, size and color. The "warrior bruise" is obtained from rough play on the athletic field. You can also suffer the bumped-into-the-table bruise and the mystery bruise. Regardless of where it originated, a bruise is not pretty. It forms when a body part is struck and blood escapes from punctured capillaries under the skin. The blood pools and forms a mark that often is a combination of colors. Make some adjustments to your diet to help chase the black and blues away by reducing the risk of bruising. If you bruise easily, you might not be getting enough Vitamin K. The vitamin promotes blood clotting, which helps prevent bruising. It is often used after surgery to reduce bruising. Foods that are high in vitamin K include spinach, brussels sprouts, Swiss chard, green beans, asparagus, broccoli, kale and mustard greens. Taking a vitamin K supplement is also an option. An adult should consume 120 micrograms of vitamin K per day, according to Dietary Reference Intake standards. Vitamin C builds strength in the walls of your capillaries. Strong walls are less likely to leak blood, which is the cause of bruising. The vitamin also speeds the healing process. It is recommended you ingest 90 milligrams per day of vitamin C, which is abundant in citrus fruits, kiwi, pineapple, strawberries and watermelon, as well as leafy greens, tomatoes, green and red peppers and sweet and white potatoes. Vitamin C also is available as a supplement. The role of zinc in preventing bruising is not as well-established as vitamins K or C, though it is known to play a role. "Zinc is important in wound healing and skin repair, but it's probably more important for older people," said Lorraine Meisner, a former professor of preventive medicine at the University of Wisconsin, on the website MotherNature.com. Foods that are high in zinc include oysters, veal liver, sesame seeds and dark chocolate. Consume 11 micrograms per day of this mineral. Zinc is available as a supplement. Numerous nontraditional methods of bruise prevention exist, including the application of parsley, cabbage, St. John's wort and arnica plants, or the comfrey herb to a bruise. Be wary. Such preventative measures have little scientific support. Consult your doctor to tailor a plan to prevent bruises.